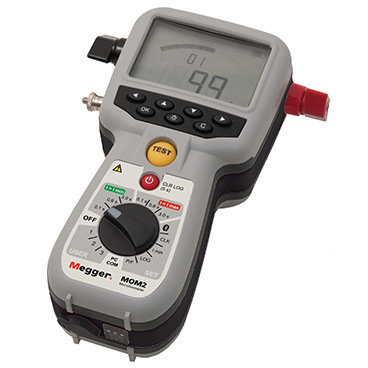 Megger micro-ohmmeter puts 200 A in the palm of your hand! 200 A micro-ohmmeter in the palm of your hand! Weighing in at only 1 kg, the Megger MOM2 is 200 A micro-ohmmeter fully capable of testing circuit breaker contact resistance to IEC 62271-100. A rugged, handheld device weighing just 1 kg, the new MOM2 micro-ohmmeter from Megger is, despite its small size and weight, capable of carrying out tests at currents up 220 A. This makes it a convenient and time-saving alternative, in many applications, to bulky and much more costly conventional high-current micro-ohmmeters that typically weigh ten times as much. A further key benefit is that this innovative instrument operates from rechargeable batteries that give over 2,000 measurements per charge, allowing it to be used to carry out a full day's testing in locations where no mains supply is available. The MOM2 is suitable for an extensive range of applications, including testing busbar and cable joints, and carrying out contact resistance measurements on low-, medium- and high-voltage circuit breakers. Circuit breaker tests performed with the instrument conform fully to IEC and IEEE standards. In addition, to ensure maximum user safety, particularly in substation applications, the MOM2 supports DualGround testing for circuit breakers. This allows both sides of the circuit breaker to be earthed while the test is performed, thereby eliminated potential hazards from induced voltages. Megger's MOM2 high-current micro-ohmmeter use ultra capacitor technology to achieve its unique combination of size, weight and performance. In a patent-pending circuit, a capacitor with a value of hundreds of farads is charged from the battery, and then discharged into the circuit under test. Voltage and current in the test circuit are monitored continuously during the discharge, and an average value of resistance is displayed. Depending on the resistance of the test circuits, a guaranteed minimum test current of 100 A can be achieved for 3 seconds, with higher currents up to 220 A for shorter periods. The MOM2 is auto-ranging and measures resistance from 1 µΩ to 1 Ω. Results are shown on large LCD display that incorporates an analogue arc to show the start of charge of the ultra capacitor. Provision is made for internal storage of up to 190 test results, which can subsequently be downloaded via a wireless Bluetooth connection. 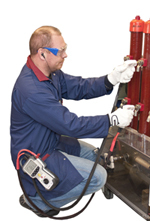 The Bluetooth facility can also be used with a headset to provide an audible pass/fail signal against user adjustable limits as tests are performed. The instrument is supplied as standard in a robust transport case with two 1.3 m test cables fitted with Kelvin probes, a sturdy rubber holster, a charger and a copy of the MOM2 Win software package for convenient processing and archiving of results. Optional accessories include test leads up to 15 m in length, and a Bluetooth kit incorporating a headset and a dongle for computers that lack built-in Bluetooth capabilities.